Dan Freedman is a successful children's author, but writing did not come easily to him at school. "I was disengaged and, with English, I would be the one to go up to my teacher and say 'I can’t do it, I've got no ideas. I'm not good at writing, I'm not good at English,' " he says. Dan's love for football meant he was still absorbing language, though. "I'd be reading the match reports," he says. "If you're reading about 'Zlatan [Ibrahimovic]'s rasping rocket of a shot, which arrows through the air past the goalkeeper's despairing dive, onto their flailing fingertips or ricocheting off the underside of the quivering crossbar', you're picking it up. "Because of your passion for it, you know what it means." Dan went on to write a series of fictional books about Jamie Johnson and his dreams of becoming a professional footballer. His stories have since been turned into a popular TV series and Freedman has helped to develop the new Premier League Primary Stars programme, which was launched last month. 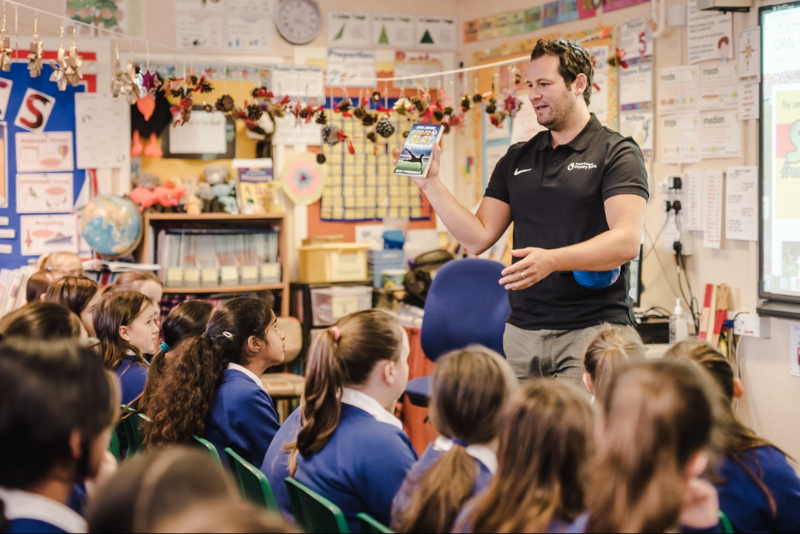 The initiative uses the appeal of professional football clubs to inspire children aged 5-11 during their studies, through free teaching resources. Dan is one of the many experts who have helped to create lesson plans and activities, which include video material featuring top-flight players. Having seen one of the lessons himself, he says: "The videos were incredible and I would have been exactly the same as those kids. They were so wide-eyed, they were absolutely accepting of every bit of information. They were remembering it. "So it's very simple but it's genius. "As soon as you put that badge on it, or that name 'Premier League', you're speaking directly to that voice in their head, because that's what's going on in their head anyway. "If you're going to deliver the curriculum the first thing you need to do is relate it to their lives." "The second thing is, as a teacher, you lose that effect a bit, because they've heard you saying things so many times. "But what's brilliant about Primary Stars is each resource begins with a video. If you've got Theo Walcott or Sadio Mane there then, even if they're saying exactly the same thing the teacher's been saying five minutes before, immediately it's going to go in. "The teachers do amazing work. What Primary Stars is going to do is make it easier for them to do that work because they've done the lesson planning. What they're going to present to the kids is accessible, interesting, engaging content. "Hopefully it's going to really help schools achieve their goals, directly aiming towards the curriculum."